Inca Trail permits for 2019 and 2020 - when to buy these? As you will probably have read by now, Machu Picchu can only be accessed by train or on foot. The routes on foot are mostly the 2 versions of the Inca Trail and the Salkantay Trail which takes the back route to Machu Picchu. As these are all hikes of at least several hours or even several days, most visitors opt to visit Machu Picchu using the train. In order to travel from Cusco or the Sacred Valley to Machu Picchu there are three train stations one can use; Poroy Station, Ollantaytambo Station and Urubamba Station. The first one is the station closest to Cusco since trains stopped departing from Cusco in 2010 and is located at about 30-40 minutes’ drive from Cusco. Ollantaytambo Station is located in the Sacred Valley in the town with the same name. Ollantaytambo is the last village in the Sacred Valley and therefore this station is the one located closest to Machu Picchu. Urubamba Station is the station that has less frequencies and is actually only used during some times of the year, mostly during the rain season. The train journey is beautiful and recognized as one of the most impressive ones in the world but the impacting part of the journey is the one between Ollantaytambo and Aguas Calientes (Machu Picchu Town) as this is the narrowest part with snowcapped mountains on each side and original Inca Terracing next to the Urubamba River. The first part of the train journey between Poroy and Ollantaytambo runs partially besides the road so provides the same scenery as those traveling by road to the Sacred Valley. Therefore, when it comes to enjoying the trip to Machu Picchu as much as possible but avoiding overly long travel times our recommendation is mostly to travel by car to Ollantaytambo Station and take the train from here. The same goes for the return to Cusco or the Sacred Valley. Poroy Station; Poroy is small town en route to the Sacred Valley from Cusco at about 30-40 minutes’ drive. 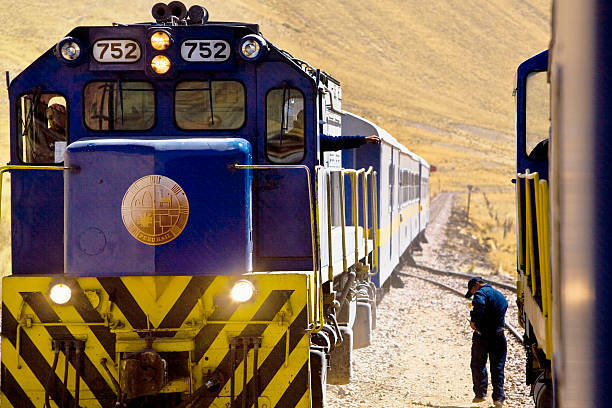 Since trains no longer depart from the station in Cusco center the station of Poroy is now the station closest to Cusco and sometimes promoted as the Cusco station – which it is not as there is still some driving involved. Poroy operates most services for both train companies but does not have many frequencies as most trains depart here in the (early) morning and arrive in the (late) afternoon or evening. For those taking the luxury Hiram Bingham Train Poroy is the recommended train station for departures and arrivals. From Poroy the train journey takes just under two hours to reach Ollantaytambo Station from where it is another hour and half to reach Aguas Calientes Station (Machu Picchu). The total train journey is just under three and a half hours. The station has a small coffee shop and restrooms available. Please keep in mind that during a large part of the rainy season this station does not operate. Ollantaytambo Station; Ollantaytambo Station is the station located in the Sacred Valley (Ollantaytambo is the last town still connected by road from Cusco) and takes about one and a half to two hours to reach from Cusco. From Ollantaytambo Station the train journey takes about one and a half hour to reach Aguas Calientes. As it is slightly faster (and definitely cheaper) to travel to Ollantaytambo via road instead of the train, Ollantaytambo is the train station with most frequencies for all train types. Most people opt to travel either from Cusco or the Sacred Valley to Ollantaytambo and here embark the train taking them to Machu Picchu. If coming from Cusco using this station instead of Poroy can save you about 1 hour of travel time, a travel reduction that is especially interesting for early departures or late arrivals. The station has a waiting room, restrooms, small coffee shop and shops as well as good restaurant which is part of the hotel in the station. Urubamba Station; the Urubamba Station is a station that is often overlooked or not taken into consideration. This is a small station that is located next to the Belmond Rio Sagrado Luxury Hotel and therefore mostly known as the luxury Hiram Bingham Station from the Sacred Valley. Nevertheless in the rainy season when trains are not departing from Poroy, there are several other train types and frequencies departing from this station. The station is not very well foreseen with shops in case you would have to wait. As this station is only located at about 20 minutes from Ollantaytambo in car the station is not very popular in general. When it comes to enjoying the trip to Machu Picchu as much as possible but avoiding overly long travel times our recommendation is mostly to travel by car to Ollantaytambo Station and take the train from here. The same goes for the return to Cusco or the Sacred Valley. This trip is designed for people not having too much time and therefore focused on the true essence of Peru; Cusco and Machu Picchu. This package includes guided tours of Lima, Cusco, Sacred Valley and Machu Picchu where you will be able to spend two days. This package is made for people who want the best of both worlds in 10 days. After visiting Lima, you will continue to visit Cusco & Machu Picchu before heading for the Amazon Rainforest for a 3 day stay in one of the most pristine parts of the Amazon rainforest.